I don't have anyone who would fall into the hero category but would love to see Tom Silva just being Tom Silva. I have spent money to see Steve Bace and Brian Sedgeley showing tips and tricks and would do it again. My wife, she hasn't thrown me out of the house for my growing stack of Systainers! Peter, I met Norm Abram while he was still doing the NYW. He is every bit the gentleman in person that you'd expect in seeing him on TV. I've never met Tom Silva, but would like to. Tom's use of Festool tools on This Old House has only been for the last 6 years or so. Yes, I understand your point and agree but it is an easier term to use for the thread rather than "who would you like to have a chat with". Don't let the semantics stop the flow though. From a Festool perspective I would want to meet several of the product engineers who are also woodworkers. From a woodworking perspective I would like to meet John Economaki in his woodworking heyday. And a close second is David Marks. Too many people have contributed to my understanding of Festool to single anyone out, but for woodworking in general it would be my late Uncle Bjarne, a carpenter by trade who built many things with mostly just hand tools, boats, homes, his vacation cabin, furniture, etc. Unfortunately I only had the opportunity to meet him once and was too young at the time to appreciate his knowledge but thankfully saw some of what he did. Uncle Bjarne will be smiling at you now Paul. There have been so many great people who have trod these various paths before us and it is good that some are not forgotten. Thanks Peter. I often learn more trying to understand how on earth craftsmen of old did stuff without the benefit of the tools we have today. This has been a core principle for me in commercial printing and prepress where some folks did fantastic work absent todays digital tools or even predating graphics cameras. For example the story of the success of John James Audobon is sorely incomplete without including the nameless engravers who transformed his bird drawings into the prints we know today. Having seen with my own eyes his original drawings adjacent to the finished product it is clear there are many unsung heros in his success. The same goes with the great old buildings going back into antiquity, folks doing stuff I wouldn't know where to begin using tools and techniques that today are either scoffed or marvelled at depending on the beholder. Nearby here is an old (by California standards) residence turned art museum, the Crocker, the times I go there I look at the craftsmanship of the old building as much as I look at what it's supposed to house. I realize there are far grander examples back east or especially in Europe and even Asia, but it's good to appreciate quality wherever it is manifest. Back to the question. Hero, idols etc are very big words for me. But somehow I'd say that most of you guys who bother answering my questions and replying to my threads or maybe just inspire me by doing what you are doing are "my heroes of the moment". I admire all kinds of craftmanship! I admired my late dads weldings...so well done that grinding/polishing wasn't needed. I admired my uncle who was taught as a brick layer but made beautyfull racing kayaks most of his working life. Now retired making beatyfull furnitures as a hobby. I admire the beauty in american shaker furniture made by skilled carpenters using hand tools only. I admire some of the late danish furniture designers who made danish design popular world wide. I admire....every skilled person actually! +1 on meeting and having a pint with Peter, Rick, Peter, Paul, Shane, Kev and all the rest of you guys...you're just too far away from little Denmark! I would have considered myself fortunate to have met John Lucas. And this evening I'll raise a glass to John for all his contributions to so many woodworkers of all levels. Having met John, the next on my list is Wharton Esherick (1887-1970). Of course, I didn't find out about him till only recently, so, I will just have to meet him through exploring his creations. There are so many woodworkers that I admire and all are fine craftsman. Many are on this site. They are so very talented which is why I dont post photos of my work. I worked with a guy in Houston, S. B. Hancock. His work was pretty amazing. He didn't use power tools. He made violins. One of his violins was played by Andre Previn. I once asked him how he made violins. His response was, (essentially), get some wood and take away everything that doesn't look like a violin. A friend of mine was an apprentice antique (woodwork) restorer and has had his own woodworking business for years. He no longer advertises at all. All of his work comes through the A list community by word of mouth. His work goes all over the world, he uses amazing materials and finishes and his work is stunning. He is the guy I turn to when I need advice and he lets me have a few off cuts now and then. But...I already know him and see him regularly and so he cannot be on my hero wish list. Seeing what Jobsworth said earlier, I think that it would be super to meet up with fellow FOGgers - I really enjoyed meeting up with him and Green Fever last weekend; great guys - like all woodworkers around the world (and skill level does not come into it at all). I would like to meet Bob Marino (because I know he looks after his customers) but I am lucky enough to know Warren Smith of Toolfest who is the UK equivalent of Bob and a great dealer with a true regard for customer service. He lent me the DF700 that I have used in all of my (DF700) videos - at no charge AND he paid for shipping. Likewise, should I have ever the opportunity to visit Denmark, you're on. Norm Abram. I always made time to watch him. Of course - you're great buddies with Norm, lucky guy - you not him (that is Brit humour!). Please tell your friend Norm that he has at least one fan over here in Blighty - and tell him that I expect to meet him about this time next year. Probably a bit of a tangent ... but I'd love to be able to sit and watch one or two of the finest craftsmen that make such things as violins, etc and just be able to ask "why are you doing that?" about a hundred times. My thought too. A great grandfather, two grandfathers and a father all craftsman in wood and no longer available for long talks about their skills, some of which are now lost to us all. I would also like to meet Festool's head designer. There are also some FOG members, but I will not embarrass them or myself. And there are others I could just share a beer with and talk tools. I'd love to get together with all the nuts with video cameras; give and get tips, ideas, "can't believe I left that on the bench when I recorded" stories; fun stuff. FOG hero to meet, though... Vinny, definitely (VSM_4 the artist formerly known as vindingo). Great work and a lot of green in motion! There are some movie set builders here, too. The whole way it is built differently would be intriguing to see; tight schedules, very temporary, needs to look like any number of things. Likely some creative problem solving going on there and that's always interesting. Kinda awkward having to pick one person here; plenty I'd like to hang out with and a lot of great craftsmen. When I first read post topic about woodworking hero...... Fog member Vinnie/VSM 4 first came to mind...from his design, to expert craftsmanship , it's truly amazing. Great thread...I would like to meet lots of people from FOG...I have learned from and admire so many folks from here. Vinny's work is inspiring and I always appreciate Peter's thinking and how to use tools....great ideas. I have had the pleasure of meeting Paul-Marcel at WIA last year (although he may not remember me) and would love to see him make videos. One of these days I will hopefully meet Shane. Nothing to do with Festool, but slightly to do with woodworking (and lots of other projects) - I'd like to meet Adam Savage. I've always liked Mythbusters, but recently I've discovered the Tested YouTube channel. There's all sorts of random stuff on there (and I've lost probably a couple of days over the last 3 weeks or so) but I really like Adam's 'one day build' segments. They hark back to his days working as a modelmaker at ILM, and have to some extent inspired my latest custom systainer project, which I've been doing over the last couple of days & will be posting about this weekend. As many people have said there are so many fantastic members on here it's hard to single one or two out. I'd love a 'FOG expo' at some point - a massive 3 or 4-day FOG meet with hundreds of members from all over the world, with demos, classes, and lots of good beer & food!!! That's probably the only thing that would ever cause me to sell some Festools to buy a ticket! Peter: Sorry for your loss. Tinker: I have met erock, and spent an enjoyable afternoon in his shop and house; well worth it, and he is exactly as he appears on his great video's. And I agree that it would be great to meet PaulMarcel and Peter Parfit. I'd also like to meet my fellow engineer Rick Christopherson, partly to find out why he is so much smarter and cleverer than myself! AND, I'd love to meet YOU, Tinker. AND, I'd love to meet YOU, Tinker. I've had that honour, and he's a real star! Every bit as you would expect, and then some. Not that the other foggers I met weren't, they were great too! Guido Henn is one I have thought about since my previous post. (You beat me to it Greg) He has come up with some truly great ideas. I have never understood a word he has spoken on any of his demo vids. My darling wife could interpret, but words are not necessary. I come away from those views with a great education. He does not have to speak in anybody's tongue, but he is so very explicit in getting his point across, even a complete moron would understand every move ... and remember. For JRB: That was a very enjoyable meeting, nearly an entire day short. You and your girlfriend were great and she was so very upbeat. She could be an inspiration to all of us. All who were there that day enjoyed a wonderful and memorable meeting. I would like to meet the guy who thought up the domino! It will not be in 2014 but could be in 2015. Karl Hungus who was involved in the Nihilismus Schule would be a blast to meet. I grew up watching Norm but I have to say Marc Spagnoulo (spelling?) from thewoodwhisperer.com has been my guy I learned a ton from Marc and he introduced me to my festools. That would be you, Mr. Parfitt, as i like your didactics, i believe.. I would love to meet Norm Abrams and Tommy Silva... Also, Pete Nelson (the treehouse guy), and Henry Klumb, a german architect who had worked with Frank Lloyd Wright and finally settled in Puerto Rico, where he had a furniture factory. His furniture designs are totally consistent with the weather on this Island. Roy Underhill. I plan on taking a class at the Woodwright's shop later this year. The late great James Krenov. Although he may be considered the anti festool but still love reading his books and looking at his work. For me it would be Norm Abrams, Tom Silva, Roy Underhill. I grew up watching them on public television in my area. I think it would have to be Noah, building an Arc with the equipment he had. Would have like to have seen that. Most of my woodworking has been self taught through YouTube, so I'd start there. Steve Ramsey and Mark Spagnuolo of course, Frank Howarth, Etc. But the one guy I'd like to Han out with for a day is Jimmy DiResta (he uses a Domino, it counts). If you haven't seen his channel and his stuff on MAKE: then you really are missing some cool stuff. Not only would I like to meet him, but I'd kill to spend a couple of weeks in Jory Brigham's woodshop watching and learning the way he works. His style is very much what I endeavor towards and his pieces are unmistakably recognizable as his own. I am happy to say I was a fan of his work long before the Framework win. Well, actually - it would be Peter Parfitt. I learned all about Festool from Peter and he is an inspiration for me to learn more about woodworking and I truly admire his channel and all of his videos. I love his level of perfection, work ethic and the way he explains/teaches methods and attention to detail. Thank you Peter! Well done! "who would you like to have a chat with". 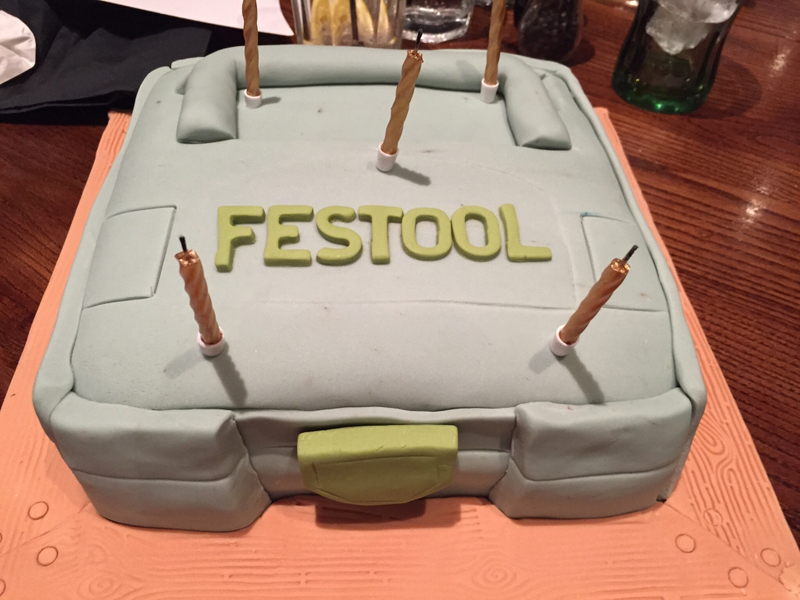 I won't say he is a huge Festool advocate and when I started following him I dont think he used the Festools. Now he has some video using them. If we are talking strictly Festool Jerry Work just has to be at or near the top. Back in 2008 Jerry wrote up an MFT table instructional that I think was 52 pages. It still holds up even though the MFT is different now. He was an early advocate of getting rid of the table saw, which I never agreed with, but he proved it could work. One regret I have is never traveling the few hours to meet James Krenov when he was alive and teaching at the College of the Redwoods within driving distance of my shop. I've read all of his books and he is the person who most inspired my furniture building. I did a weekend workshop with Sam Maloof that I will always remember and of the people out there today, Roy Underhill is a delight to watch with his tool history and also a very talented craftsman Timothy Rousseau from Appleton, Maine an instructor at the Center for Furniture Craftsmanship. Tim publishes a lot of his work with details in Fine Woodworking magazine. Peter Parfitt and Norm Abrams. There are many people on this forum that I have learned many things from and they have helped me greatly and I thank them all. I have to say Erock (Eric) has helped through all of his series of videos on Youtube as (MrBigerock) the most for what I am trying to learn. The LR32 video was great for me. I also thank you, Peter for all of the superb reviews and instruction you do. Many thanks Chris for all of your support both here and through YouTube. When I created this thread I was toying with the idea of arranging a FOG get together here in the UK. Not an informal bash in the back garden (Ron - I admire you and your wife for the efforts that you have made doing just that) but something a little more elaborate. I needed a sponsor (or funding) and I also wanted to get a celebrity to attract FOGgers to the event. I am a great fan of Norm Abram and would so love to meet him. I thought that he would be the "must have" guy to invite to the party. When I was new to the FOG I got a lot of help from the work of Paul Marcel and so he, with Norm, were my "dream team" for the FOG event. I have exchanged emails with Paul from time to time and he has always been very helpful and I count him as a (distant) friend. I did not get the help that I sought for the big UK FOG bash and if anyone that I asked for help now steps in to remedy matters then great but if not then I will chalk it down to experience and me putting too much faith in companies rather than people. I have no intention of embarrassing anyone who was involved so don't ask about this detail. So, this thread was all about drumming up some interest which I then though would lead to a big announcement that Norm or Paul (or both) would be here in the UK. Bang goes my chance of meeting either of them but if either of you guys read this - thank you for everything and you are my woodworking heroes. Top of the list would be Norm since my fascination with woodworking and power tools started from watching the New Yankee Workshop as a teen. I'd really like to spend a day in the shop with ERock too. I learned so much about using the LR32 from his youtube videos, I think I could really learn a lot more from him. The Festool (Hero) I'd like to meet is myself. I still don't know him, so God, I'm dying to find out. I'd like to meet you to. If you can find yourself. All kidding aside, I would love to come overseas and meet a ton of you and experience an entirely different way of woodworking. The Local tribes have similar flood stories. It is ubiquitous. If you talk to him, then find out "what happened to the unicorns?" Same here Peter, same here. Not especially for the woodworking, but just to see America and its people. And would love to meet some of you FOG heros. I've always enjoyed Frank Pellow's posts. With his cabin and just general informative projects, I could sit down with him, have a beer, and look out into the woods and talk tools and woodworking. There are Norm, Tom, Tommy Mac and others I wouldn't pass up a visit with. Just saw this thread. I think David Marks would be very high on my list. He does incredible work. I would like to have spent time doing woodworking with my grandfather. I was too young when he passed away to really benefit from his knowledge. He was a builder in New Zealand around the 1940s and 1950s. He was known for building to a specification, not a price, and if it wasn't right he would pull whatever wasn't right down and do it again. I remember when his eyesight failed and he couldn't do woodworking anymore. He passed away a few years later. People say that I take a lot after him, and my middle name is his first name. You brought some great flooding memories for me with my grandfather who passed away (94 years old) when I was 14 years old . He was Danish and immigrated to Australia before WW1 and fought with the aussies and after the war migrated to Dunedin NZ. He had a carpenter / cabinet shop in the "Octagon" (main street of town) in the 1930's. I remember him making his own wooden clogs, cabinets, stools, woodworking benches and anything else that was wooden. To this day we still have his stools. Simplicity but solid. I remember all his woodworking tools and his bench saw etc etc. It's funny when you get older, you think about these things more. I too wish I spent time woodworking with my grandfather. Sorry for the rant but great to have someone feel the same way. No apology required mate, sounds like a similar story to mine. Goes to show our heroes are sometimes a lot closer to home than you think. I was very close to my cousin's grandfather, a farmer, and he was my favorite Old Timer. I still have his two man saw over my fireplace. I had spent time at the other end of that saw with him on occasion. I was living on my great uncle's farm in those days being raised by my father's cousin and her husband. Great Uncle and great aunt lived in the same house. I called him "Grampa" and my Grt Aunt I called "Gramma". "Grampa" had a garden to the wonder of all within a radious of miles. Towards the end of his life, I had just returned from my two years vacation with Uncle Sam with a side trip to the orient. Grampa was dying slowly and I was able to help him out in his garden somewhat every weekend when i visited. I have often wished I had spent more time with "Grampa and Gramma". He had so many little tricks to raising vegetables earlier than anybody. He was so attuned to nature, I wish i could have learned so much more from him. The person I wish I had listened to was "Gramma". She had soooo many wonderful stories, especially about my great grand father and even more about my great great grandfather who was a missionary in Hawii. I seldom listened with concentration to her stories, those were always about "ancient history" to me. I preferred listening to my cousin (her son-in-law) and his friends. Those stories were about hunting and fishing and farming in a time and place i could better relate to. Gramma was stricktly old time. I had no time to listen to her "rambling". Today, I wish I had listened better. I somehow picked up the story telling habit from those folks back in my farm living day, but I never had time to listen to "Gramma". She was the treasure I never fully appreciated. I was absorbed on YouTube last night when it jumped into my mind that my answer to this thread is clearly mirock. His creations are so darn clever, creative, and well engineered I eagerly await his next masterpiece and have tried to view all his older videos. Watching him design and build his shop made machine shop using earlier generation shop made machines is fascinating. I might have to wait for the weather in Ukraine to become a little more relaxing before I visit. PS I should also mention his cinematography and editing - among the best on the 'net. Well Peter for me it would actually be yourself that I'd like to meet. Just like Paul was an influence on you buying Festool you were the same for me. I will of course bring biscuits and a breakdown of how much you owe me for the money you've made me spend! You've also been very generous with your time with emails etc. That is very kind but when I started this thread all that time ago I was hoping that we might have a Festool get together here in the UK. I even had a pretty big venue organised, free of charge, not far from the centre of London. The plan was to try and encourage people like Paul Marcel to come over here for the event. I also had (and still have) a burning ambition to meet Norm Abram despite him not being a known Festool user. He, unknowingly, helped me to retain my sanity when I was working away from home for 5 years. I think you should do an open day at the New Brit Workshop Peter! I can bring cake! There were few ways to take Alex post, with some being double entendres. Pretty humorous. Brilliant birthday cake Stuart ! Given only one choice, I would choose Seth (@SRSemenza). Since I joined this forum, every post of his I read, and every bit of advice he gives, almost seems like something he just finished doing himself 20 minutes ago! Without a doubt, he if for me the voice of experience! Dang man, thanks very much! Not sure I deserve hero status. You are correct though, I have just finished everything 20 minutes ago ....... well sometimes 25. If only he was still alive....I would like to meet Sam Maloof....premium woodworker and museum quality furniture designer....oh if only I could rock in one of his rocking chairs. We did a tour of his house in Upland, Ca... Or Azuza, or somewhere off the 210 FWY. Yes - I rocked in the chair. Some of it was a bit over the top, like wooden hinges for the doors. Yes one CAN do that, but it is the wrong material. Really that is about all I did not like. Everything was good on the tour. So you can still visit it. I took a weekend workshop in Berkeley at the "Cutting Edge" store shop in the 1980's with Sam making a chair over the weekend. He was one fantastic guy who didn't hesitate to share his knowledge and even gave us his shop telephone number to call him if we had any further questions from the workshop. I did take a few pages of notes over the weekend and did wind up calling Sam to get some clarification on his finishing technique and it was like talking to an old friend. He was a very special man. VERY easy to pick: Norm Abram, because he is the only woodworking hero who i would love to meet in person is still alive. I became a woodworker because of his New Yankee Workshop...he made furniture making look doable for any average person. Tage Frid (general woodworking), James Krenov (hand tools), Sam Maloof (chairs), and George Nakashima (live-edge creations). I totally agree with your list and when I first got started Take Frid's "Teaching Woodworking" was an invaluable book. Reading all of James Krenov's book gave me much insight into the natural look of wood in furniture and a very fine appreciation to hand tools and sharpening those tools. I have mentioned previously that I met Sam Maloof and took a weekend workshop that he ran in Berkeley, Ca back in the 1980's. I have a great appreciation of George Nakashima's use of live edges and slabs in furniture construction. We have been lucky in the past decades to have so many great men and women in the craft. I should add Edward Barnsley to the list, it would have been brilliant to spend some time with him in his workshop. .....three great names in the industry that cover all areas. In no particular order Norm Abram, Roy Underhill, and Bill Ng are at the top of my list. on more than one project. If you bring Norm with you then you can both stay for dinner ! !